NASAengineers are working to identify a problem with the asteroid-bound Dawnspacecraft after part of its attitude control system shut down. Themalfunction occurred June 17 and knocked out one of Dawn's four attitudecontrol reaction wheels used to orient the spacecraft as it flies toward thetwo biggestasteroids in the solar system. 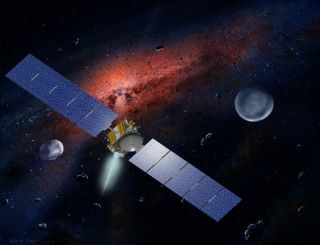 Dawn'smission is aimed at exploring the asteroid Vesta in 2011 and 2012 and dwarfplanet Ceres — which is also the solar system's largest asteroid — in 2015. Currently, the problem is not expected to throw Dawn off its asteroidrendezvous schedule, NASA mission managers said. "We'relooking at the data carefully in order to understand what the long-termprospects are for this reaction wheel," said Marc Rayman, Dawn's chiefengineer at NASA's Jet Propulsion Laboratory in Pasadena, Calif. "In themeantime, we're continuing our planned activities with the spacecraft." Typicallythree of the four wheels spin at any given time. Different spinning speedsallow the spacecraft to hold steady or rotate as needed. The problemarose when "all members of the team but the insomniacs and the spacecraftitself were slumbering," Rayman wrote in a Sunday mission blog entry.Automatic sensors detected an unusual excess of friction building up onreaction wheel No. 4, and shut it down accordingly. Engineershave mostly ruled out the friction buildup being the result of a new softwareupdate, reactivation of the spacecraft or a recent velocity change. Such aproblem would normally have prompted Dawn to activate its unused reaction wheelas a replacement. But all four reaction wheels had already been operatingbecause the spacecraft had entered safe mode. NASAengineers had also periodically given each reaction wheel a rest during part ofDawn's mission, but will now simply keep wheels 1, 2 and 3 going, missionmanagers said. For now,Dawn continues toward its target asteroid at more than 9,800 mph (15,850 kph). The Dawn missionlaunched in September 2007 and has already traveled 213 million miles (342million km) from Earth as of June 27, and has 30 million miles (48 million km)more to go before reaching the asteroidVesta in August 2011.